So last weekend Rob, Chip, and I inadvertently stumbled upon the Reggae King of Japan, Rankin Taxi. I’m not sure if that is his real name. Taxi-san. Note the mosh pit. We had been at our favorite Hayama beach bar, LAH, having cocktails (they have margaritas! Real frozen ones with straws!) 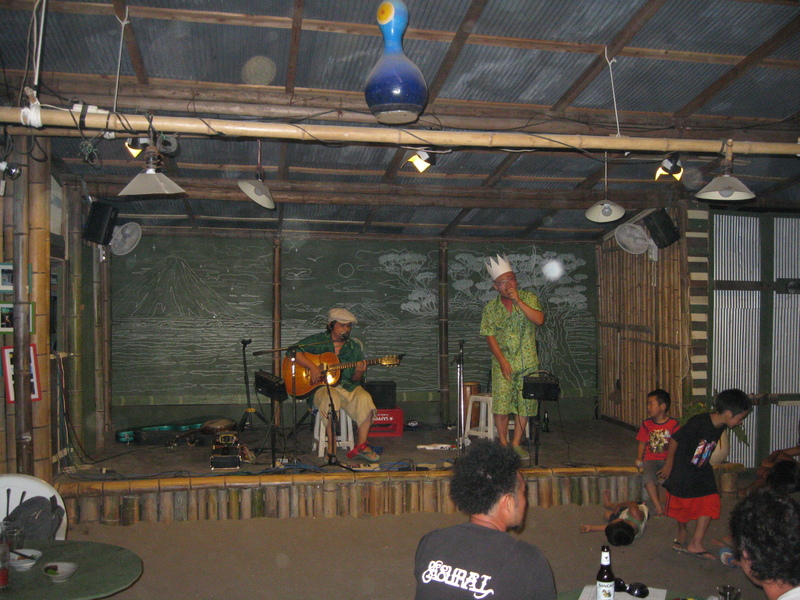 when a very friendly fellow named Tosh (like Peter) told us we had to get to another bar, Oasis, to see the king of Japanese reggae. I didn’t even know there was a Japanese reggae scene, much less a king of it. It was closing in on Chip’s bedtime, but I felt we couldn’t pass up this cross-cultural opportunity. Oasis was packed and Rankin Taxi was worth the visit. He is definitely the first Japanese man I have ever seen wear a paper crown. Chip was mesmerized. Rankin Taxi sang in Japanese except for the refrain to one song which was “Catch…and release!” What a natural resources management term has to do with reggae I might never understand, but the music was really catchy. Taxi-san was accompanied only by a guitarist, and it made for a lovely, mellow sound. Sometimes reggae is a little apocalyptic for me, but I really enjoyed this. Rob took a video, which you can see here (or on his flickr page). Rob did some research when we got home and found this article on Japanese reggae, too, which is very informative. It makes it sounds like the dancehall variety of reggae is more popular in Japan. Rankin Taxi was definitely more sway-along than dancehall. I’ve said it before and I’ll say it again, globalization never ceases to amaze me. I love this guy’s music. I had a couple of his songs prior to reading this and was just glad to see him getting recognition. It’s a bit hard getting his music here in The Bahamas.